NEW YORK -- The Dow Jones industrial average and Standard & Poor's 500 indexes soared to their biggest gains since the presidential election on Wednesday and set all-time highs. Investors bought stocks that do well in times of faster economic growth, like technology and industrial companies, but they also snapped up stocks that pay large dividends. 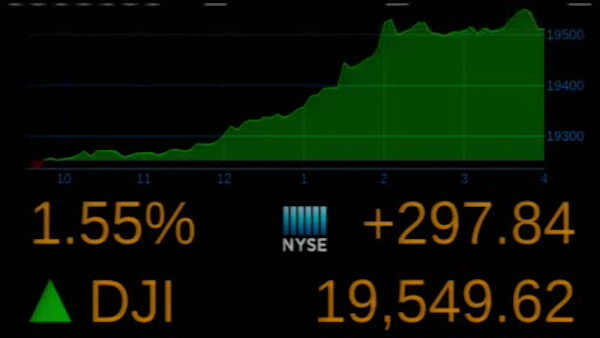 The Dow Jones industrial average jumped 297.84 points, or 1.5 percent, to 19,549.62. The Standard & Poor's 500 index rose 29.12 points, or 1.3 percent, to 2,241.35. The Nasdaq composite recovered from an early loss to rise 60.76 points, or 1.1 percent, to 5,393.76. That was about five points short of its all-time high. A wide array of companies that stand to benefit from faster economic growth also climbed. Home improvement retailer Lowe's rose $3.94, or 5.4 percent, to $76.40 and truck maker Paccar jumped $3.20, or 5 percent, to $67.63. U.S. Steel added $1.54, or 4.3 percent, to $37.49. Abbott Laboratories moved to terminate its purchase of diagnostic test maker Alere. Abbott agreed to buy Alere in February for about $5.8 billion, or $56 per share. But since then, Alere has recalled a key monitoring device and delayed a financial statement, and it's being investigated over its overseas business. Alere said Abbott's lawsuit is without merit. European stock indexes jumped as investors anticipated that the European Central Bank will extend its bond-buying stimulus program Thursday. The stimulus is designed to boost growth and inflation. European stock indexes climbed. Germany's DAX gained 2 percent and the FTSE 100 in Britain rose 1.8 percent. The CAC 40 of France picked up 1.4 percent. Japan's benchmark Nikkei 225 rose 0.7 percent and the South Korean Kospi inched up 0.1 percent. The Hang Seng in Hong Kong gained 0.5 percent.